Monday, November 11 is Veterans Day. We hope you take a moment to thank and honor a friend or family member who has served our country and protected our freedom. On behalf of all of us at Oakland County, we thank our veterans for their sacrifice. For over 50 years, Oakland County Veterans Services has provided services to veterans and their families residing in Oakland County. Our experienced benefits counselors are dedicated to ensuring that the sacrifices of our nation’s veterans are recognized, and that they and their families receive all veterans benefits to which they are entitled. And in being a division of Oakland County Government, these services are provided free of charge. Click HERE to find out more. 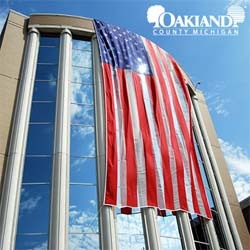 Don’t forget that the Oakland County offices will be closed in observance of the holiday Monday, November 11.